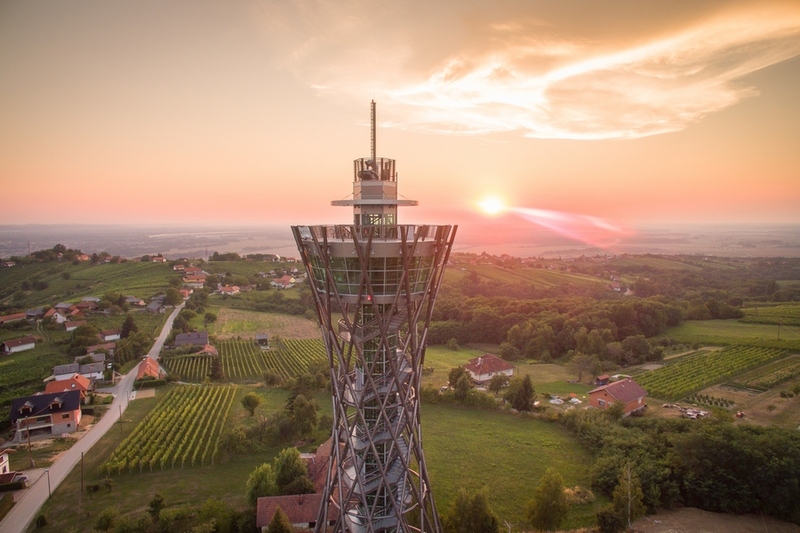 The Vinarium Lendava is a steel construction observation tower located in the wine-growing area of Lendava city in northeastern part of Slovenia neighbouring to Hungary and Croatia. The Vinarium Lendava opened on 2nd September in 2015 and has rapidly become a favourite destination for visitors who are looking for new, authentic places where they can enjoy local experience trough view, taste and kindness of local people. The 53.5 m high tower stands at 302 m above sea level among the vineyards on the Wine-tourist road and offers scenic panoramic 360° view over the Lendava hills (Lendavske gorice vineyards) and further to the Mura river with it`s beautiful peaceful forest and all the way to flatlands and hills of Austria, Croatia and Hungary. You can reach the highest platform of the tower by a comfortable ride with the elevator or by climbing 240 steps. The Vinarium Lendava was designed by architect Oskar Virag. The Lendava hills or the Lendavske gorice vineyards spread from the village Dolga vas to the village Pince in length of approximately 9 kilometres and cover an area of 500 hectares. Almost the whole area is planted with vine. The star attraction, the Vinarium Lendava, stands in the heart of the smallest and one of the most typical Slovenian wine-producing sub-region of Slovenia – in Lendava hills close to Hungary and Croatia not far away from Austria. The tower architecture symbolises waved branches of basket and by that, it symbolizes the idea of intertwining cultures, coexistence and friendship of nations. The tower, whose construction lasted for seven months, can take up to 50 visitors who can climb the 240 prefabricated stairs or simply use the elevator. In the ground floor, one can visit a restaurant, buy souvenirs or get information at the information point. Around the tower, the local culinary and wine offer is available at the little houses or at the family run wineries, farms and restaurants. In the recent past years, the most dominant industries in Lendava were oil industry, chemical and pharmaceutical industry, metal-processing industry, light industry services and building construction. Due to the economic and negative demographic changes in the last couple of years, there was a need to boost more sustainable concept of economy. With the respect to the local economy development concept, special attention was given to the Viticulture in Lendava. Long and rich history in wine-growing and noticed interest in leisure activates like biking and hiking, preserved typical wine wine-growing landscape, cultural-ethnographic heritage and typical local culinary specialities lead to idea of re-designing the tourist offer in Lendavske gorice vineyards. To connect all these individual touristic products there was a need to establish a connecting platform that will connect and promote these individual touristic products nationally and internationally. In our case, this connection platform has become the Vinarium Lendava. Process that facilitated the change already started in 2010 with the construction of basic municipal infrastructure and placing the area of Lendava hills on the Wine-tourist road map. Despite the effort, the outcome was still resulting in fragmented concept with the lack of harmonized offer that would be available also during the weekdays (and not only on weekends). In 2013, Mayer of Municipality of Lendava mag. Anton Balažek and its team prepared project proposal with the title “The observation tower on the tourist road Lendava hills” for the project call “Regional Development Programme 2007-2013”. The construction of the observation tower started in January and finished in July 2015. The observation tower Vinarium Lendava opened on 2nd September 2015. The implementation started together with the project proposal within which the business development was foreseen. Planned yearly number of visitors was 40.000 what is in average around 3.333 visitors per month. Average monthly visits, according to planned, increased in 2015 for 120 % in 2016 for 136 % and in 2017 for 148 %. Special recognition to Vinarium Lendava in terms of successful implementation is also “Sejalec”, award for most creative and innovative achievements in tourism received in 2016. Implementation in case of the Vinarium Lendava is continuous process that highlights timely planning, continuous education, cooperation and integration. Another important issue is the awareness that the implementation is a continuous rather than a closed process. Based on this, the Vinarium Lendava is becoming a unique tourist attraction that brings together cultural-ethnographic heritage (Castle, Pyramid, Typical houses, Mummy of Captain Michael Hadik, Jewish cemetery, etc. ), typical local culinary specialities (bograč, perec, vine, etc. ), leisure activates (hiking & biking) and festival events (Festival Vinarium).